Post-formed countertop (the kind with the integral backsplash and drip edge) is quick and easy to install -- as long as you don't have to cut it. Then it's awkward to handle, the backsplash requires a separate cut, and the plastic laminate chips easily. Commercial fabricators use large stationary saws with 12"- or 14"-dia. blades to cut their countertops to length. 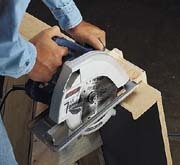 Few of us have that type of equipment, but you can get accurate results with a circular saw and a shop-built jig. The jig mimics the simple guide a lot of people use to cut plywood, but it has a second (shorter) leg that wraps around the backsplash. I built my jig out of scrap 3/4" plywood and used some leftover 1/2"-thick pine for the cleats that guide the saw. Make the jig base slightly wide, then trim it with your saw. Then install the cleat on the short leg of the jig and trim that side of the jig as well. Because the edge of the jig is now perfectly aligned with the saw's blade, you position this edge on the countertop right on the line where you want to make your cut. Once you've got the backsplash cut, set the countertop on sawhorses and cut the wide section. The teeth of the saw blade enter the face of the plastic laminate, so chipping is minimal or nonexistent. You'll want to hold onto the cut-off section so it doesn't snap off near the end of the cut and damage the laminate. Freshly cut laminate has a sharp edge, so be careful when handling it. You can use 220-grit sandpaper and a sanding block to smooth the edge.